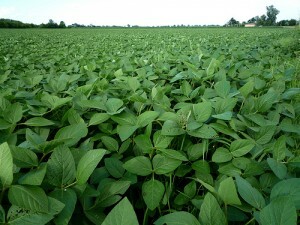 Nothing beats soybeans for deer food plots when it comes to nutrition, tonnage and attraction. I smiled when I saw the small group of deer headed for the plot of standing corn. I had been debating my friend Todd Hewing about what was the best late-season food-plot crop for whitetails. Todd argued that soybeans are the ticket, but I would hear none of it. Common sense — and all that I had read — told me that corn supplies much-needed carbohydrates to whitetails trying to survive brutal conditions. Those carbs are what fuels a deer’s body and creates body heat during digestion. While hunting, I have witnessed mature bucks feeding in soybean food plots from the first days of October’s early archery season through the last day of the late season in January. More important than the opportunities soybeans offer to hunters is the nutritional benefit they provide whitetails after the hunting season has closed — when deer need it most. When I started planting soybean food plots, I would simply get some seed from my farming neighbors. It was hit or miss. Some years, it worked great, and I would enjoy some excellent hunting action throughout the season. Other years, it didn’t work so well because the soybeans would “shatter.” That’s a farming term that simply means the bean pods would split open and drop the soybeans onto the ground. I probably don’t need to tell you that a soybean food plot with beans lying in the mud or under a few inches of snow is not a good thing. Did I forget to mention that the last four bucks I shot were taken in the late season — and all were in or near my soybean food plots for deer? Yep, those soybean food plots for deer work like magic.